The below artworks are the most important by Joseph Beuys - that both overview the major creative periods, and highlight the greatest achievements by the artist. Artwork description & Analysis: This work on paper dates from Beuys's early experimental phase, which was characterized by the artist's production of thousands of drawings under a self-imposed program of aesthetic asceticism. Beuys worked at this time mostly in solitude, as though under a strenuous search for self-enlightenment, simultaneously seeking a new artistic language that would combine the spiritual and the physical, the solid and the fluid, the ephemeral and the permanent. Woman/Animal Skull suggests a melding of the rational and the instinctual, or of the human and the animal minds out of a primordial state of organic chaos. Artwork description & Analysis: Fat Chair exemplifies how Beuys could turn two common materials of everyday life - here the organic components of fat and wood - into a composite, open-ended metaphor for the human body, its impermanent condition, and the tendencies for social life to conform to constructed convention. Created in 1964 and encased in a glass, temperature-controlled museum display case, Fat Chair subsequently underwent a slow, natural process of decay until 1985, by which time the fat had almost entirely decomposed and virtually evaporated. Through these basic organic compounds, viewers may well have imagined themselves occupying this chair, thus endowing Fat Chair with the status of a "proxy" for self-reflection on the transience of human life and the need to consciously and expeditiously channel one's own organic and-alas-ephemeral energies. Artwork description & Analysis: In this performance piece, Beuys could be viewed - his head and face covered in honey and gold leaf - through a gallery's windows, a slab of iron tied to one boot, a felt pad to the other, as the artist cradled a dead hare. As though carrying out a strange music (if not some macabre bedtime story), Beuys frequently whispered things to the animal carcass about his own drawings hanging on the walls around him. Beuys would periodically vary the bleak rhythm of this scenario by walking around the cramped space, one footstep muffled by the felt, the other amplified by the iron. Every item in the room - a wilting fir tree, the honey, the felt, and the fifty-dollars-worth of gold leaf - was chosen specifically for both its symbolic potential as well as its literal significance: honey for life, gold for wealth, hare as death, metal as conductor of invisible energies, felt as protection, and so forth. 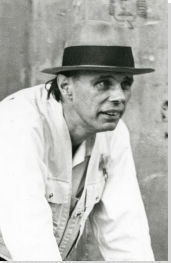 As for most of his subsequent installations and performance work, Beuys had created a new visual syntax not only for himself, but for all conceptual art that might follow him. Artwork description & Analysis: In simply wrapping a grand piano in utilitarian grey felt, Beuys encased a mammoth, sonic instrument normally employed for the creation of music, with a "bandage" that essentially muted and muzzled it. Like most of his works, the title reveals much of the idea behind it. "Homogenous" suggests that the composite work is, or has recently become, a singular item, something formerly sundered apart and healed, or made whole again. "Infiltration" may suggest one's desire to penetrate the felt skin and restore the instrument back to the practical realm of the everyday bourgeois living room, or recital hall. The entire ensemble (in the manner of a visual "chamber music") relates back to the artist's own experience after being shot out of the skies during war duties and the German nation's own desperate aspiration for a new kind of postwar, collective composure. Artwork description & Analysis: As though it were an oblique self-portrait, there is arguably no other work by Beuys that is so intimately representative of the artist's healing fable by nomadic Tartars during World War II. Tethered to the Volkswagon Bus - a sure sign of an entire era of antiwar demonstration, international social upheaval, and underlying global nuclear Cold War dread - are twenty sleds, each equipped with what Beuys considered essential for personal survival of an unspecified (or unanticipated) human or natural calamity. Perhaps even more important, the sleds are exiting the bus, not being towed by it, as at first it may seem. This suggests that each sled is an independent and sentient entity, here released (or born) into the wild to find others in need of rescue. Artwork description & Analysis: The subtitle of this work indicates that 7,000 Oaks was fundamentally a time-based, or "process" work of environmentalism and eco-urbanization. Beuys planted 7000 trees in the small, historic city of Kassel, Germany, over several years (carried out with the assistance of volunteers), each oak accompanied by a stone of basalt. Beuys's concerted effort to physically, spiritually and metaphorically alter the city's social spaces - economic, political, and cultural, among others - is what finally constituted a community-wide "social sculpture" (Beuys's own terminology). 7000 Oaks officially began in 1982 at Documenta 7, the international exhibition of modern and contemporary art that is organized, by a guest curator, at Kassel every five years (since 1955). Beuys's own ecological "happening" drew to an official close five years later, at Documenta 8, after being continued by others for a full year after Beuys's own death.